has been telling me about the video for her new single, Feel So High, and whether the song holds personal relevance. The Florida-based artist talks about the music scene in St. Petersburg and tells me whether more material will come later in the year – she picks a promising artist we should get our ears around. 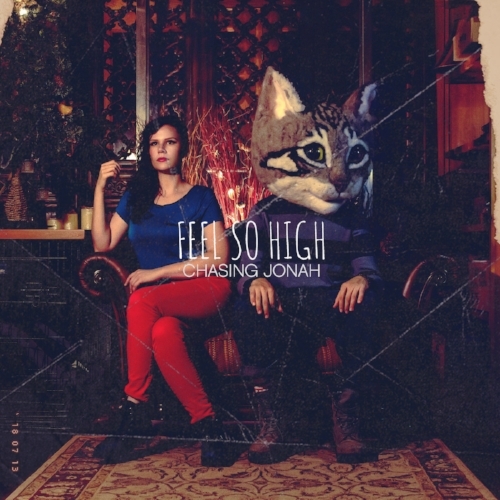 I ask Chasing Jonah whether touring, and U.K. dates, are a possibility and how important it is being up on the stage; how she spends her downtime; the advice she would give to artists coming through – she ends the interview by selecting an amazing track! Hi, Chasing Jonah. How are you? How has your week been? It's been chaotic, but fun! Just finished filming another music video and I'm so tired that I'm not even sure how I'm still forming coherent sentences. I'm an Alternative Electro-Pop artist and songwriter currently living in St. Petersburg, Florida. My lyrics tend to be introspective and vulnerable and I tend to pair them with cinematic and electronic sounds to help drive their stories. All of my writings have been inspired by personal experiences and internal battles. I also love dogs and key lime pie. Feel So High is your new song. What inspired the lyrics? Does it hold personal relevance? It does hold personal relevance. I know it comes off as a flirty and seductive song at first, but it's really about being caught in an unhealthy and, yet, addictive relationship; something you keep getting sucked back into even though you know it keeps hurting you. It is an instant and memorable song. Did you know, once it was recorded, it would be an instant earworm? It is definitely one of my personal favorites. It's so much fun to play and I love the synth sounds in it. You never know how other people will feel though. Releasing your art into the world is always a vulnerable process no matter how confident you might be in what you've created. What inspired the fun music video for Feel So High? It started as a joke in the studio between myself and the producers. We were making up preposterous scenes that involved a cat. I decided I would actually bring it to life as a joke and everyone on my team ended up loving it. Is there more material coming later in the year, perhaps? Absolutely! We've got a few more singles and music videos on the way! The music video for War Paint has taken on a life of its own! Has it been strange seeing how far it has gone?! The music video for War Paint started as a collaborative concept with some of my fire-spinner friends based out of Orlando, Florida. It was a lot of fun to create - and they even taught me how to use poi, fans and a little dragon staff so I could play with them. The song itself ended up being featured on the second season of the T.V. show, Lucifer, and that also really helped to draw attention to the video! Being based out of Florida; what is the music scene like where you are? Are there a lot of great local artists? I love the music scene in Florida. I currently live in St. Pete and I love that there is always a good show happening somewhere. I've also found a lot of great acts in Orlando and Jacksonville as well. A lot of us really enjoy trading shows with each other, which really helps the community. This fall, I will be mostly touring through the East Coast of the U.S. and part of the Midwest. Some of my favorite cities that I look forward to going back to are New York, Philadelphia; Atlanta, Asheville and of some cities throughout Florida. I'm also planning on visiting some new places like Austin, Dallas; Chicago and more! Might you be heading to the U.K. at all? Do you like British music? I would absolutely love to! We will see where these single releases bring us! I would love to head to the U.K. next year and, yes, I love a lot of British music. Daughter has been one of my biggest inspirations as well as James Blake, Labrinth and Florence + the Machine. I definitely try to make the stage my home when I'm there. It can be terrifying sometimes, especially when it's a new audience that doesn't know you. You're basically getting naked in front of people that can judge you, shame you and/or be rude to you if they wanted - or they could love you. But, when it's an audience that already likes you, it feels as though you're inviting loved ones into your home and connecting with them on a deep level. It's definitely a challenge when circumstances are always changing. When you start out, you can play to a handful of people or a few hundred people on different nights. Some people are so drunk that they try and talk over you and you wonder why you're there - and then some people are there because they really love the music. Sometimes, you have a sound-system that doesn't work well and you can't hear yourself, so you're just hoping that you're on-pitch the entire time and sometimes everything sounds and feel so perfect it's like you're floating on a cloud. My goal has been to stay consistent no matter what the circumstance is; to perform like it's the best show every time. I'd really love to just have great and successful releases and a really fun tour. Maybe, a few more T.V./film placements as well. Right now, I'm also working on trying to finish my new album by the end of the year. One of the most moving experiences I've ever had was sitting in a room with an incredible chamber orchestra that was recording the strings for a few of my songs (that will be on the next album). David Campbell had arranged the strings and he was also there conducting. I asked if I could sit inside the tracking room as they were going through the songs before they started recording. I sat on the floor and just wept. It was the most beautiful sound and feeling I had ever experienced. I thought to myself: ‘If not a single person downloads these songs or cares to listen, everything I've been through and worked for is still worth this experience’. Even now, when I'm feeling discouraged, it helps to put myself back in that moment and envision it happening again. Well; a few of my favorite musicians/artists right now are Janelle Monáe, Aurora and Regina Spektor but, if I stood in the same room as them, I would probably just pass out. As for a rider, since I constantly forget to eat, my rider would have it so my green room had tons of healthy food before and after the show. That's the one thing I haven't gotten the hang of just yet: making sure I have consistent and healthy food on the road. I would also like a box of puppies, maybe from a shelter. Maybe I could even help get them adopted at the shows. There is something so magical and calming about new life, specifically in the form of puppies. That's, like, way down the road though; when I get to the point where I'm allowed to ask for ridiculous things. My advice would be to strive to be the most authentic versions of themselves. People respond well to honesty and it really shows in your art. It's easy to get discouraged, but when you really put yourself out there, those who resonate with what you are doing will support you. It takes time, but being able to create your unique art that really impacts people is so much better than being a flash in the pan. Not everyone will like what you're doing and that's ok. The point is to be able to do what makes you happy and what helps you become a better person. If people really connect with what you're doing along the way, then that is a great plus. At this moment, I've got a slight obsession with Aisha Badru. I discovered her by chance on Instagram and I can't stop listening to her. Her lyrics are so deep and I also love her music videos. I really don't get much time, especially before new releases. I do have this bad habit of working myself until I mentally and physically just crash. Luckily, I live about fifteen minutes from the beach and another ten minutes from a bay where you can see dolphins. Being in those environments really helps me re-center when I remember to take the time for myself. Bridges by Aisha Badru. The music video for that song is a masterpiece.